I am a natural blonde, however my hair is more of a darker blonde shade. 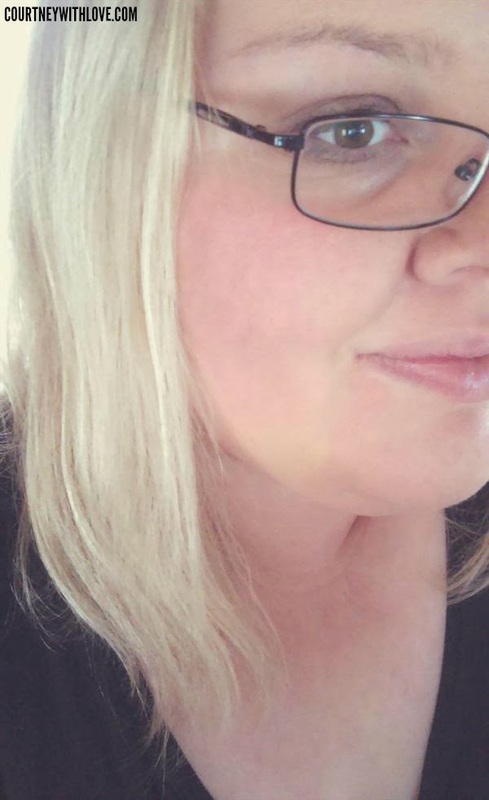 For years I have always lightened it to a more extra light blonde color. In that time I have used so many different products made specifically for blonde hair that claim to be "salon quality" and in all honesty, I just never found them to work for me. They always seemed to be on par with regular drugstore brands. Nothing to write home about. 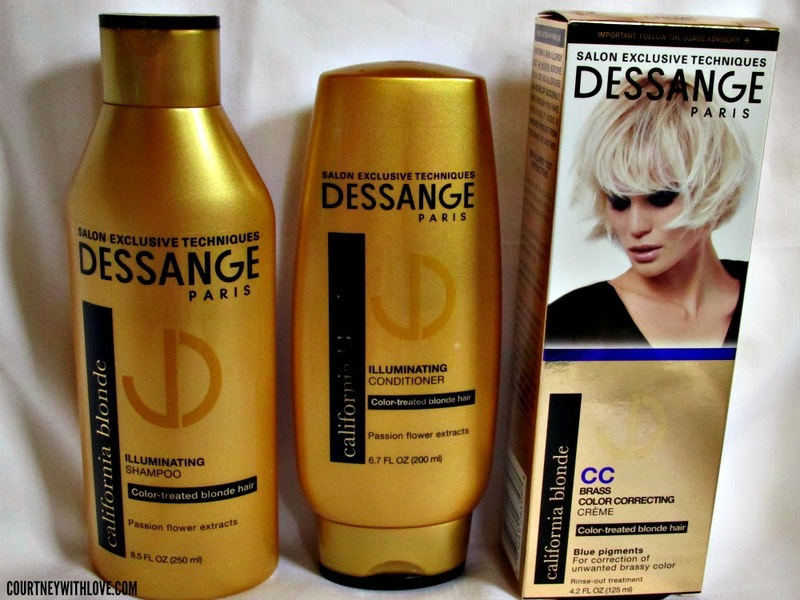 I was sent a couple hair care products from a line that has recently launched here in the USA called Dessange Paris. Right away I thought it was going to be a bit of a gimmick, like so many of the others. The 3 products I was sent are part of their California Blonde line, which of course is made specifically for us brilliant blondies! First we have the Illuminating Shampoo, then the Illuminating Conditioner, and finally the CC Brass Color Correcting Creme. All 3 are made for color treated blonde hair. All seemed like a perfect match for me and my hair. So for the past few weeks I have been religiously and exclusively been using only these Dessange Paris products on my hair. So here are my final thoughts! I have to say that I am 100% completely in love with both of these. My hair feels incredibly soft, and so manageable after using these together. I start off by using a quarter size amount of shampoo in my hair, and lather it up in my hair. I am sure to really work it in, and give my scalp a good scrub down. I work this in, focusing a lot around my hair line, since thats the area where I tend to get dry and sometimes flaky. After about 2 minutes, I rinse my hair. The scent of the shampoo (as well as the conditioner) is a bit floral with a slight nutty scent. Both have passion flower extracts in them. Once the water is clear, I take a quarter size of conditioner, and I focus that mainly from my mid-length hair down through my ends. My hair is baby fine, and if I put conditioner on the top near my roots, my hair will just be completely flat. Plus the roots really don't need the conditioning since they are so close to my scalp which produces natural oils. Once worked into my hair, I let it stay on my hair for a good 2-3 minutes (longer if I need deep conditioning), and then rinse it out. After towel drying for a bit, I take my hair down to naturally air dry. Once my hair is dry, I am easily able to brush out my hair. No snarls, and less frizz. My hair looks gorgeous! It bounces when I walk, and honestly my hair feels the best and looks the best that is has in well over 10 years! I have been raving about Dessange Paris to all of my family and friends! I am beyond impressed! Definitely a company that I will be sticking with, and purchasing! As I said above, I color my hair to a much lighter shade. I tend to choose neutral or cool toned blonde shades, simply because my hair is naturally quite golden. Because I choose these "blue" based blonde shades, my hair easily tarnishes in color and can become brassy. I have used purple and blue based shampoos and treatments for a while, and I always had 2 big issues with all of them. First, they would be hard to peg just the right amount of time to leave on my hair. Too little time and I don't reach any results. Too long of a time and my hair will have a purple, blue or gray hue to it. It was frustrating. I would waste a lot of product trying to reach just the right tone. Second problem, all of these treatments and shampoos would wreck havoc on my hair. After washing the product out, my hair would feel incredibly dry, and I would end up having to do a couple oil and conditioning treatments just to bring my hair back to life. Because I was having such great results with the Dessange Paris shampoo and conditioner, I had high hopes for this... and let me just say this CC creme broke all my expectations and made me so happy with the results it gave me. The creme is a indigo color, very opaque. I applied enough to my hair so all strands were coated, and let it sit on my hair for 10 minutes, the longest amount of time listed on the bottle since my hair was super brassy. I admit at first I was kinda scared I'd end up with blue hair, but I didn't. After 10 minutes, I rinised out the creme, and again let my hair air dry. When it was done, I brushed it out and was shocked. I had the color blonde that I have been wanting for so long, but brassy tones always hid. I was beyond happy, and that completely sealed my stamp of approval for the Dessange Paris products! I cannot begin to tell everyone how much I recommend this company. You can currently find Dessange Paris products at Target. They are a bit on the more expenisve side for some, coming in at $9.99-$11.99, but they are 100% worth every penny! A big thank you to Influenster for senidng these products to me complimentary to review!